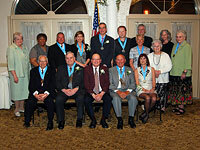 The honorees of the Toms River Hall of Fame are graduates and attendees of Toms River Regional Schools that have gone on to be great influences in their chosen fields of study. Past honorees have included those in the areas of business, education, law enforcement, music, speech/language, economics, television, and journalism. Copyright 2010 Toms River Regional Schools. All rights reserved.